Product code: T825 Categories: Antique, Antique Engagement Rings, Art Deco, Art Deco Rings & Art Deco Engagement Rings. Here is a very sweet and charming hand made 18ct Art Deco diamond engagement ring set with a European cut diamond that has so much detail and will always be loved and admired. Only hand making a ring can you get as much fine detail as this, and is just one of the many reasons why genuine Art Deco engagement rings are continually so popular and highly sought after. The detail on the shoulders with the white gold as well as from the other side of the ring shows how much time and attention to detail that went into making this engagement ring all those years ago. In the centre is a lovely genuine antique European cut diamond that measures 0.25 carats and has sits perfectly in the centre for all to admire. 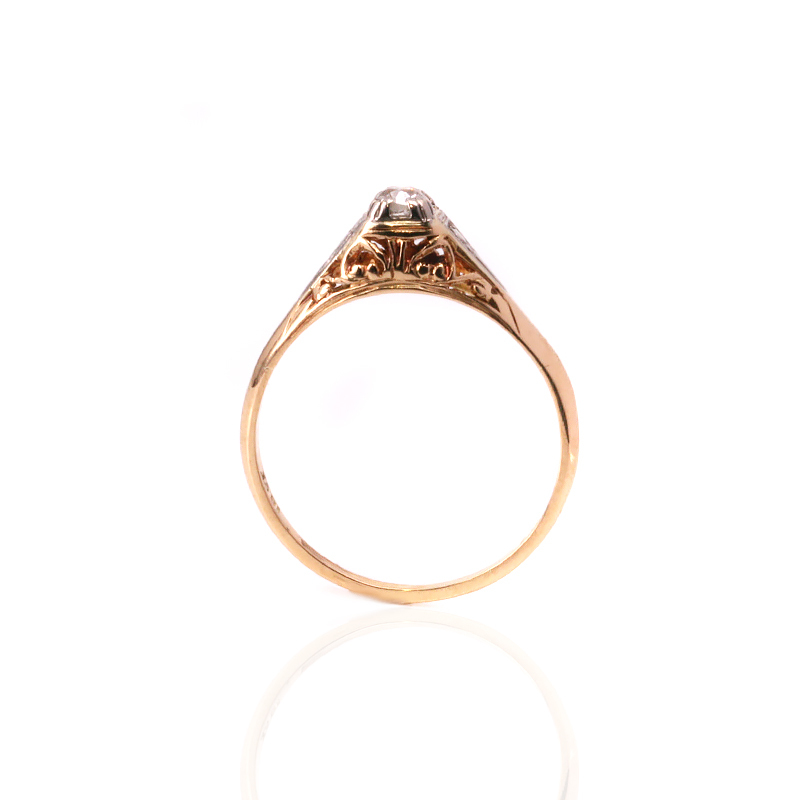 Measuring 5.3mm wide, this ring will look good on its own or worn along side a wedding ring. 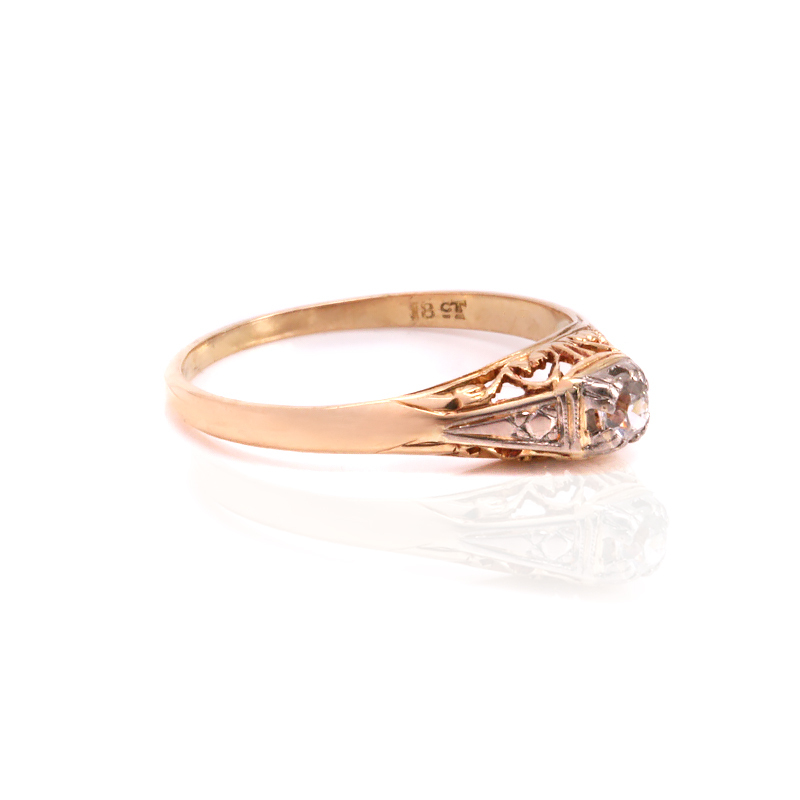 A lovely example of a genuine Art Deco diamond engagement ring for that special person. This Art Deco diamond engagement ring dates from the 1920’s and was all hand made. Set with a genuine antique European cut diamond, there is nothing like an Art Deco ring on your finger.